Our Alesund cruise port guide gives you information about the docking location, cruise dock, transportation options and much more! 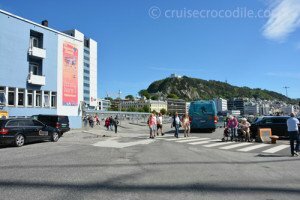 Welcome to the Ålesund cruise port guide. Ålesund is a city in Norway with about 45.000 inhabitants. It is a famous fishing port in the country, although it is most famous for its Art Nouveau style. In the night of 23rd of January 1904 a fire broke out and it completely destroyed the city centre. Out of 12.000 people that lived in Alesund, 10.000 were left homeless within one night. When the German troops under the command of Wilhelm Keizer arrived for support they chose to rebuild the city in the Art Nouveau or Jugendstil style. It took them 7 years to rebuild it all, but the result is amazing. Alesund is rather small although it is officially considered to be a city. There are a couple of nice places to visit in town although there are definitely some sights outside of town you don’t want to miss. The area of Alesund is dotted with islands. The ice ages ripped the land apart and created thousands of islands that you can visit today. Go to the islands of Godoy or Giske for the ultimate Norwegian experience or hop to the other islands where you can find the famous open air museum or aquarium. 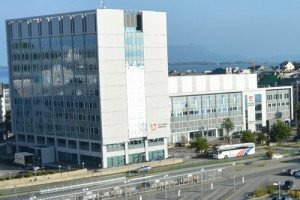 Find out underneath what it is you want to do in this Cruise Port Guide Ålesund – Norway. This is the dock of Alesund. Right in front of the dock you will find your hop on hop off bus, limited amount of taxis, public transport and the tourist train. This is your view from the ship. As you can see there is a large parking lot with all kinds of facilities like local buses, hop on hop off bus, limited amount of taxis and the tourist train. From the ship you will also see this building. This holds the public library where you will find free wi-fi. How are you? – Hvordan har du det? In Ålesund the cruise dock is located at a very convenient spot in town. It is literally a 2 minute walk from port into the city. You have 2 options of where to dock, find option number 1 and 2 on the map above. As you can see they are right next to one another and all cruise ships will still use the same exit. From here the town is only a couple of minutes away. The Art Nouveau centre is right in front of you. 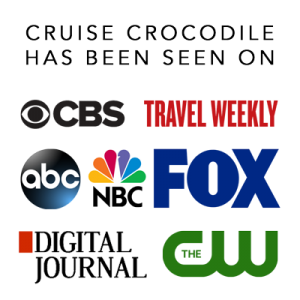 At the exit of the cruise dock you’ll find a tourist information centre that provides you with maps and all the local tour operators and attractions will advertise their products via leaflets and brochures here. The bus station is located right in front of the exit of the cruise port. All the blue buses are local buses that go to all the sights to see out of town (except for Fjell Stua / Mount Aksla). To ride the bus simply pay de driver +/-70 NOK cash to get a ticket. The bus to Moa (largest shopping centre) is 628, 608, 618 and 624. The bus to Atlantic ocean park is 614 or 618 (but doesn’t stop in front of Atlantic Ocean Park) The bus to Sunnmore open-air museum is 618 or 624. The bus to Giske and Godoy is 662 or 664 All of the above buses depart from the bus station in front of the cruise terminal. Most buses depart every half an hour. To find out the exact schedule you can visit the bus operators website by clicking here. There is a hop on hop off bus available in Alesund. You can spot it right from the ship. It is one of those red double decker buses. It is a nice option if you are planning not just to stay in town, but also if you are planning to visit the aquarium and open-air museum which are outside of town. Their bus is also wheelchair accessible. For 150 NOK you can join the town train. It is one of those trolley trains that will give you a guided tour of the city of Alesund. It takes about 1 hour and it will also take you up to the viewpoint. Narrations are in Norwegian, English and German. Alesund is a unique town because the fire created to opportunity in 1904 for all of it to be rebuild in the Art Nouveau style. At the end of the 20th century, beginning 21st century this was the most popular architecture style, philosophy and way of life, because in Europe it was time for something new. This photo is a beautiful example of what the city looks like today. This picture was made in the city centre about 200 meters from the ship. Your ship will dock right in front of the city centre of Alesund. Walk right into town and explore this wonderfull art nouveau city. 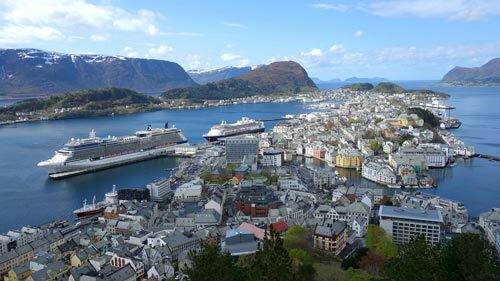 Read all about the Alesund cruise dock in our cruise port guide. In front of Alesund there are thousands of islands. Especially Giske a famous one. The Giske church is a 12th century chapel and the only one in Norway built in marble. Ask the tourist information in port about their opening hours. The best way to reach the church is by public transportation. 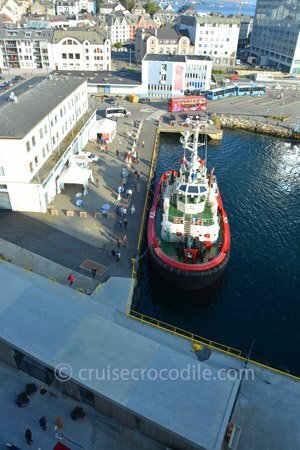 At the bus station in front of the ship you will find the bus marked “Giske & Godoy”. There are certainly interesting city walks to take through Alesund, but there are definitely also a couple of challenging hikes surrounding the town. Ask the tourist information for the Sugar tops hike to make the most adventurous one. Take a local bus to the islands in front of the coastline. Navigate the deep and famous underwater tunnels to reach them and enjoy the breathtaking scenery from the local bus. Find the local bus on the parking lot/bus station in front of the ship. The middle stop will say Giske and Godoy. Pay the driver for a ticket. From here it is about 15 km to the north west. In the city centre of Alesund you will find the Fisheries Museum in an old warehouse of 1861. This museum depicts the history of Alesund as a fishing port. This is one of the largest aquariums in Scandinavia. It depicts underwater life in the atlantic ocean and in the fjords. Make sure not to miss the penguins and the diving show. The park lies about 3,5 west of the port. Reach the Atlantic Ocean Park by public transport bus 614 or 618, 120 NOK taxi ride or hop on hop off bus. In the middle of the ocean is where we find the bird cliff Runde. This island has the widest variety of sea birds species in Scandinavia. In the nesting season from February to August more than 500.000 sea birds take over the island. Around 100.000 pairs of puffins nest here but you will also find great skuas, gannets and shags here. It is quite hard to get to Runde. By public transportation it will take you too long. There is a company 62°Nord that offers daily departures from the city centre by boat to Runde. Order your tickets online on their website. The Jugendstil museum is the best way to start any visit on Alesund. It is the old pharmacy that has been transformed into the museum that will show the importance and style of art nouveau. Make sure not to miss the exhibition from ashes to art nouveau. Find this museum within 300 meters of your ship. Sometimes the local church will give concerts. Search for a sign like this in port to see if this is also happening during your stay in port. Norway is famous for its open air museums and this is one of them. Take a step back in time and walk through the ages. This park shows you the typical houses that have been build in this part of Norway throughout the centuries. Make sure not to miss their boat collections. You’ll find Sunnmore Museum about 5,5 km east of the port. Take public bus 618 or 624 at the cruise terminal or the hop on hop off bus. This is the mandatory photo stop when visiting Alesund. From the +/- 150 meter high Mount Aksla you will get a beautiful panoramic view over the entire Art Nouveau city centre, your ship, the surrounding islands and the fjord. To get up to the viewpoint simply take the hop on hop off bus, trolley train or taxi from the parking lot in front of the ship or walk up the 418 steps. The steps start in the park in front of the hill.